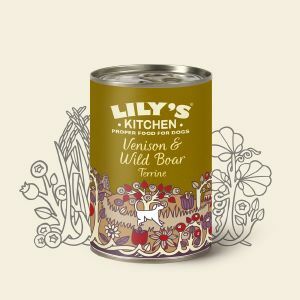 This unique hypoallergenic grain-free recipe is made with freshly prepared venison and wild rabbit. It's made with lots of veg and fruit together with our unique blend of botanical herbs, including dandelion and burdock root. We've also included hemp oil renowned for its health benefits and its rich source of rare essential fatty acids. This recipe is suitable for allergic dogs on exclusion diets. Only real meat: no rendered animal parts or derivatives, nothing genetically modified, no artificial preservatives, colours or sweeteners. No wheat, corn or soya. We use only wholesome meats, herb flowers and leaves, fruit and vegetables to produce a delicious, digestible food for dogs. Because we use the real pieces of fresh venison meat, there is a very rare occasion of finding shot in our food. We can assure that we take very careful safety measures to ensure there are no pieces of shot left in the meat but very very occasionally a small piece may have escaped us.